Guests and experts at an event organised by Orbis International Bangladesh in the capital recently to share the learning of a project – A Comprehensive Model of Eye Care in Childhood Diabetes for Bangladesh. Experts have suggested engaging multiple stakeholders in eye care service for children to combat childhood blindness called diabetic retinopathy. 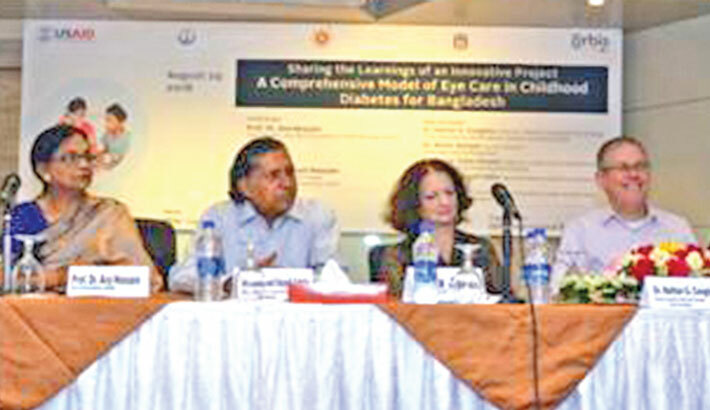 The suggestion came at an event organised in the capital recently to share the learning of a project – A Comprehensive Model of Eye Care in Childhood Diabetes for Bangladesh. Orbis International Bangladesh Country Office and Diabetic Association of Bangladesh (BADAS) have jointly implemented the project with financial assistance from the USAID-Child Blindness Program (CBP). Eye health experts and physicians said at the programme that global number of children with diabetes is growing rapidly and evidence shows that poor care during childhood increases the risk of ocular complications throughout later life. According to International Diabetes Federation estimates, the incidence of Type-1 diabetes among children 0-14 years is 4.2 per 100,000/year, meaning over 3,000 children are newly developing Type 1 diabetes in Bangladesh annually. The other recommendations from the evaluation include expansion of the comprehensive model of eye care for children with diabetes; organising more outreach eye screening camps in collaboration with BADAS affiliated associations and establishing linkages developed by the project; continuing awareness raising campaigns across Bangladesh; providing more training and continuing medical education to health professionals; and generating evidence through research and continuous monitoring. Prof Ava Hossain, Vice-president of Asia Pacific Academy of Ophthalmology, was present at the event as the chief guest. Dr Nathan G Congdon, Director of Research and North Asia Strategy of Orbis International and professor of Queen’s University of Belfast, Prof Zafar Khaled, Chairman of Ophthalmology Department of Bangabandhu Sheikh Mujib Medical University, Caroll Vasquez, Director of Office of the Population Health Nutrition and Education, USAID/Bangladesh and Dr. Munir Ahmed, Country Director, Orbis International Bangladesh were special guests. Mohammad Sayef Uddin, Secretary General of Diabetic Association of Bangladesh, presided over the event.